Women's body hair has been on the table for discussion and analysis -- as well as the pressure to do something with it -- pretty much since the dawn of time. Specifically, the female form in many ancient cultures has historically been shown as fully hairless from the eyebrows down. In ancient Egypt, shaving (with a sharp piece of flint, yikes) and sugaring were the preferred methods of hair removal, and in the Middle Ages, European women removed their eyebrows and forehead hair to create a larger brow. In recent years, celebs like Julia Roberts, Miley Cyrus and Madonna have flashed underarm hair, and Amber Rose recently showed much, much more. That choice to let hair grow out of their hair follicles, a completely natural thing for the human body to do, has been met with a chorus of disgust from commenters on the Internet and talk shows. 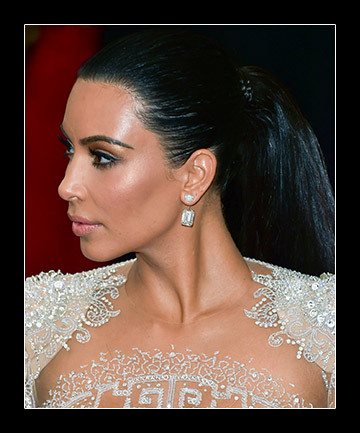 Until very recently, less attention has been paid to hair around the neckline, but the advent of Kim Kardashian (of course) talking about removing the baby hairs around her face and errant hairs along her neckline changed all that. "My forehead had all these little baby hairs, and I would always break out because of them," she wrote on her app. "Every photographer would Photoshop them out anyway, and I thought I looked better without the baby hairs, but now I miss them." Are you feeling her? Don't worry -- you're probably not the only one to grab a mirror to see just how hairy the nape of your neck is, or wonder if your ponytail looks painfully unkempt with all those stray hairs "messing up" your neckline. No matter what the internet, media or your mom tells you, it's not weird or gross for women to have neck hair. "It is totally normal/common for women to grow hair further down on the nape of their neck," says Christi Alldredge, senior specialist at Spruce & Bond. But, she adds, "Definitely consider removing it if it will make you feel more confident when you wear your hair up." Ultimately, the choice is yours. If you feel more confident about an updo with a manicured neckline, don't hesitate to experiment with waxing or a more permanent solution like laser hair removal. And if you dig that little fuzz on the back of your neck, roll with it. Ahead, 10 celebs who may inspire you to love your hairy neck -- or not. Either way, we definitely won't judge.